The course of human history has been to a considerable extent influenced by poets and in some sense they are the torch-bearers of history. Prophet Muhammad (pbuh) reportedly said that secret treasures found in the earth and heaven can be unlocked only by the tongues of the poets. Therefore, poets are compared to the keys that unlock the mysteries of life and death. On such a scale Allama Muhammad Iqbal (9 November 1877 – 21 April 1938) is one of the outstanding poets of all times and a shining star in the philosophic firmament. His is the seeing eye, a feeling heart and a seer transcending religious and geographical lines. Iqbal was the poet of the idea. Philosophy sings in his verses the message of love, hope and dignity of man. Dr. Iqbal enjoyed a charismatic persona which is reflected in his work. According to him, the evolution of life shows that though in the beginning the mental is dominated by the physical, the mental as it grows in power tends to dominate the physical and may eventually rise to a position of complete independence. Among the Muslim thinkers Dr.Iqbal stands tall having attained a position of high eminence. (Transcend reason as it is a light that brightens thy way, it is not your final destination). According to Dr. Iqbal, thought is not finite, which cannot capture the infinite (i.e., the ultimate reality) but it is dynamic and unfolds its eternal infinitude in time and reveals reality to us. He holds that idea is a necessary element of mystical experience which is outside the realm of understanding. Putting forth the intellectual and pragmatic evidence of the existence of God, he holds that man enjoys the capacity to experience the ultimate reality in the same way as he possesses the capacity to feel a tree, to build a bridge and to change the course of rivers. He holds that man is an ultimate being and is fount of all values. According to him, perception and knowledge are perception of sense, elaborated by understanding. (Everyone has made me his beloved in his sight, but I complain that they have failed to understand the message which is hidden). (Do not consider my disorderly melody as mere poetry, for I am privy to the secrets of the tavern). Dr Iqbal used his charisma in various dimensions, such as ideas of faqr (disdain of the matter), life after death, destiny, realization of self, material lust, man’s accountability for his deeds, etc). The union between philosophy and prophetic teachings is a landmark in man’s intellectual progress and it ushers in a new consciousness which is reflected in the work and thoughts of Iqbal. 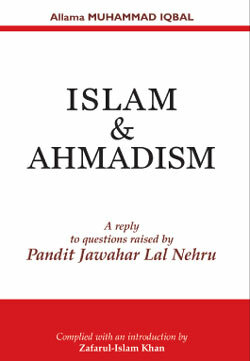 He devoted his time to understanding and portraying Islam after his return from London as there is hardly any shade of traditional love in his poetry after 1908. It would rather be difficult to elucidate Iqbal’s views in regard to the idea of “Khudi” (realization of self) which became the foundation of his success as a seer. For subtle points of Self are like a sharp sword).